But today I did it. I bought it. And there is no turning back, cuz this store doesn't accept returns under 10 yards. And seeing as there were only 5.5 yrds to be had, I'm well under their return policy limit. I am stuck with it. And I love it. I have looked at, oh, 8 diferent fabric stores (but who's counting) in the last 4 days. And not a single fabric I saw that could hold a candle to this one was less than 30 bucks a yard (often much higher). 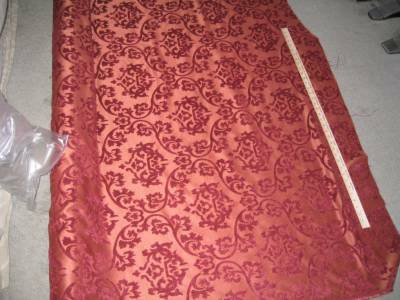 So, despite spending more than I wanted (I still refuse to admit my splurge--believe me that it was nowhere near 30 bucks a yard), I got the best fabric for the cheapest I could find while still being thrilled with my fabric. Best compromise I could make really. With the camera flash on. Brings out the bronzy/cinnamon/browness. I am somewhat concerned with the amout of yardage I have--5.5 yards (nice man only charged me for 5). 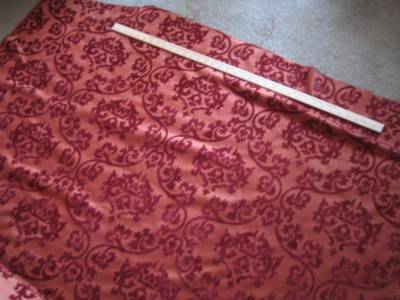 I would rather have 6-7 to account for pattern matching and give a fuller skirt (hell, I had 8 of the velvet). But I know that if I'm careful, I can make this work. 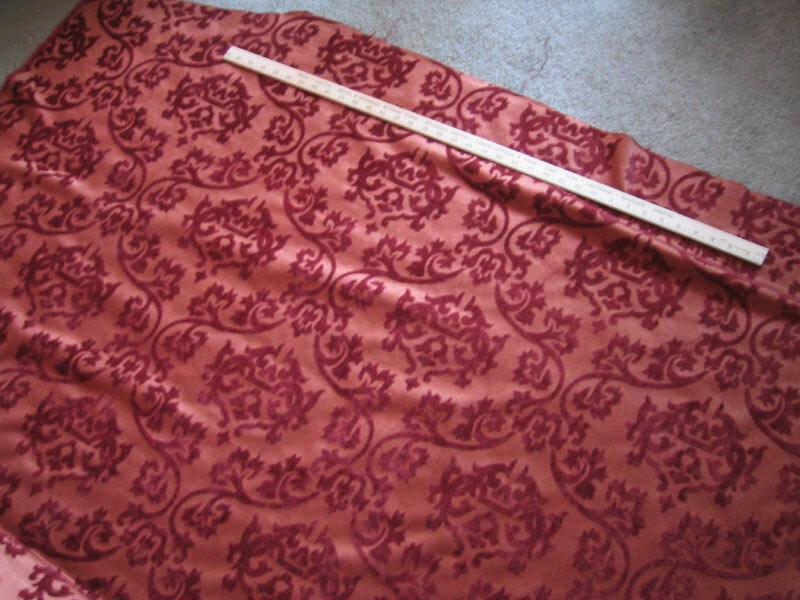 I also have a few tricks up my sleeve for fabric conservation--large swath of complimentary fabric along the bottom to lessen the yardage towards lenght for the skirts, and similar large swaths up the sides of the split skirt. I am also considering sleeves in predominantly or all complimentary fabric instead of the pricey stuff, if necesary. Or, I figure strip sleeves can easily be done using scraps from cutting if i'm careful. Now for the fun part! Since I have new fabric, I get to come up with new design concepts. This means I get to break out the expensive colored pencils from my college artclass, which I always find fun. I think I am more fond of the left one, as the deep reddishpurple seems more sultry and courtesan like to me (for more correct colors see 4th pic in previous post--middle purply red on my orange swatch). 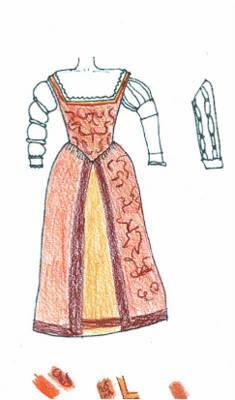 If I used this combo, I'd try to find a peachy underskirt fabic similar in color to the background of the dress fabric. The one on the right I made with the peach/orange velvet in mind (4th pic previous post, top peachy velvet) for the bands on the bottom and sides of the skirt. 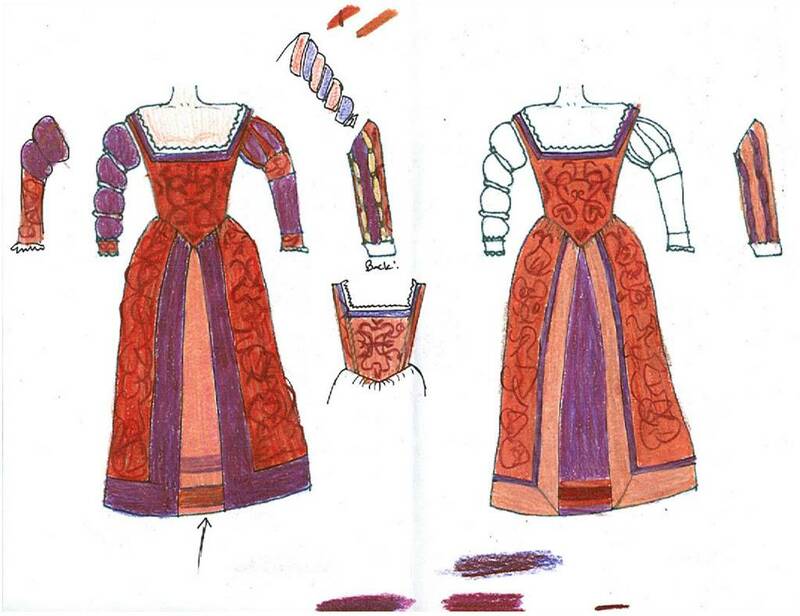 While I like the idea it seems less impactful than the deep red-purple (at least in the sketches). 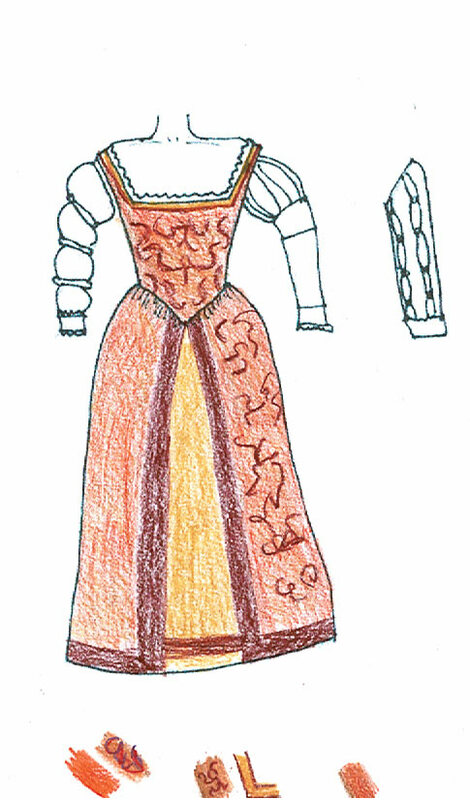 And just because it was cute that he helped: here is what adam would do (I'm considering it)--make the bottom/side skirt swaths match the dark detail of the dress fabric and do a gold underskirt. I'm clearly a better quality color-er, dont you think? (Not true really, as he was an art major, but he just didn't spend much time on this.) my concner with this is that it'd be harder to match the dress color than to just intentionally buy something different (like the purple). I'm afraid if I try to match and fail it will look as such. I love it. It is simply stunning. I can't even think of anything sarcastic to say. Gorgeous. Good job.